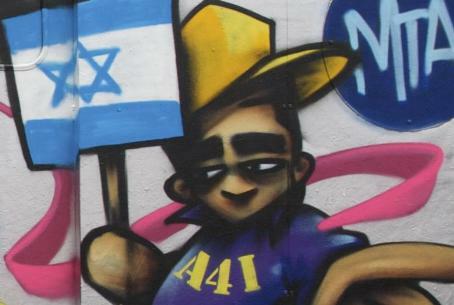 Artists 4 Israel has organized some of New York's most talented graffiti artists to show solidarity with Israel by painting Sderot bomb shelters. A group of New York’s most talented urban artists arrived in Sderot this week with the Artists 4 Israel movement in hopes of bringing some much needed color to the beleaguered Negev town lying just outside of the Hamas-controlled Gaza region. The artists aim to show support and bring beauty to a town, that since the 2005 withdrawal of Israeli soldiers and expulsion of Jews from Gaza, has had the daily lives if its residents defined by crude rockets and concrete bomb shelters. “Our tour is called ‘Project Murality,’ joining the words ‘mural’ and ‘morality’ to evoke justice through art,” explains Meital Dohan, an Israeli actress known for her role in the popular American Showtime TV Series Weeds. Dohan, currently premiering in Monogamy at the Tribeca Film Festival, has taken time off from her busy acting career to volunteer with Artists 4 Israel and help coordinate the project. Artists 4 Israel (A4I), a relatively new organization on the American Jewish scene, defines itself as a New York-based community of creative people working together on collaborate projects that illustrate Israel’s right to exist in peace and security. It sponsors and fosters exchanges between communities of artists in Israel and around the world who wish to express through artistic mediums their support, feelings and interpretations of the Jewish state. Project Murality has partnered Israeli graffiti artists with their counterparts from New York on a mission that aims to equip Sderot’s traumatized youth with inspiration and artistic tools. According to A4I, the project hopes to turn local bomb shelters into beautiful canvases by bringing some of the finest urban artists of America and Israel together to create images that inspire hope with local children, showing them that their town is not alone in its time of need.